With the next and second installment of the new DC Cinematic Universe coming soon in ‘Batman V Superman: Dawn of Justice’, I figured I should go back and do a review for the first installment ‘Man of Steel’. Although this first blockbuster entry into the upcoming DC Cinematic Universe was stuffed with explosive special effects and a very intense plot and origin to Superman, pretty much everything else was lackluster. The actors cast in their respective roles were all very good, but the drama was a little over-done, even for a comic book adaption film, and the ending ruined the entire movie, being too radical, and at the expense of the titular character as well. Plain and simple, director Zach Snyder is good at making explosive superhero blockbusters, but his skills don’t extend far beyond the action sequences, utterly failing in portraying correctly Superman’s origin and persona, for instance. While ‘Man of Steel’ was appealing to the eyes and was a good action, superhero blockbuster, the movie decimated the character and persona of Superman, despite Henry Cavil’s commendable portrayal. Having flashbacks in a film is okay, as long as there aren’t too many and they are done right. ‘Man of Steel’ seems to miss this concept completely. They have completely way too many flashbacks, about four or five, explaining Superman’s origin over the course of the first half of the movie through several flashbacks. Not only were there too many, but they got confusing. A scene would switch to a flashback without any notice, or really any reason, and at least two were done in such a way that you weren’t sure if the scene was a flashback or happening in present day and what exactly was going on. Honestly, the filmmakers could have avoided this if they just told Superman’s origin all at once and in chronological order of Superman’s life, and avoided confusion among viewers and unnecessary and sudden breaks in the story. It would have made the story-telling of Superman’s origin less confusing, along with the first half of the movie, and made it less abrupt. To say it simply, Zach Snyder needs a lesson in how to and when to use flashbacks. ‘Man of Steel’ was excessively and unnecessarily long. For a 2 hours and 23 minutes runtime for a movie that is an action, superhero, sci-fi film, the first 1 hour and 30 minutes, roughly, are filled with no action or explosions except during the opening scene. The first 90 minutes just shows a choppy, drawn-out telling of Superman’s origin story (with many flashbacks of course), deals with developing Superman’s personality and moral compass, and takes an awfully long time to set up the plot. I mean I know this movie is the building block for a whole DC Cinematic Universe but come on still a ridiculously long beginning to a film. ‘Iron Man’ didn’t take this long to get going! By doing this, ‘Man of Steel’ saved all the action for the final 45 minutes of the movie. By taking such a long time to get interesting, ‘Man of Steel’ made Superman’s origin story less memorable and made the movie itself seem really, really long. After a long, drawn-out beginning, the movie ended with a bang, literally, but ended way too quickly. The two ending fight scenes, with Superman Vs. Zod and Faora in Smallville, and Superman Vs. Zod once more in the final battle in Metropolis, the Battle of Metropolis, were short of mind-blowing. From the whole invasion by the Kryptonians to these two awesome fight scenes, the finale was fast-paced, explosive, and action-packed but could have been even better if it was handled more properly by being longer. It would have been more fitting for Zach Snyder and Co. to make the finale longer than the o-so boring beginning. Instead, the whole finale felt rushed because of the time crunch, resulting in the part where Superman and the military stop the alien invasion getting only a few measly minutes of screentime which in short made it seem like a joke. And the fight between Zod and Superman was the coolest action sequence I’ve ever seen, thanks to the overload of special effects, and could have been longer and even more sophisticated (instead of Zod and Superman just repeatedly punching each other through buildings [yawn]). In short, the finale for ‘Man of Steel’ was exciting but could have been handled better if it hadn’t been so rushed. All other complaints aside, the worst part of ‘Man of Steel’ was how it completely derived from the source material and just disregarded Superman’s persona from the comics. The movie’s climax and his fight with Zod makes it seem like he had little to no care for the safety of innocents or amount of destruction he caused. He practically obliterated the entire town of Smallville during his battle there and even more disturbing is the Battle of Metropolis. During his epic fight with Zod, a large portion of Metropolis was destroyed and easily hundreds of thousands of people were killed and Superman made no attempt to bring Zod away from the heavily populated city. This is not the Superman everyone knows and loves that, sure, is powerful, but is the living persona of good, who would take a beating in the name of even saving just one life. Instead, Superman in ‘Man of Steel’ looked like a DC version of the Hulk, who couldn’t care two cents about how many people were killed as a result of a fight. I’ve heard the new DC Cinematic Universe is trying to be dark, but if being dark causes a big conflict with a character’s persona or source material, than it shouldn’t be done. Henry Cavill is practically the twin brother to the Clark Kent of the comic books. I know Superman’s personality and persona was destroyed in ‘Man of Steel’, something ‘Batman V Superman’ will be hard-pressed to fix, but Henry Cavill fits the looks aspect of the role superbly. He certainly has the right voice for it, as well as the perfect geeky look of Clark Kent when he dons glasses. In short he is definitely the best possible pick for Superman. The supporting cast is superb is well. Kevin Costner is a very good, down-to-earth Pa Kent and Russell Crowe is the ultimate, believable Jor-El. Amy Adams is also a perfect pick for Lois Lane (minus the red hair) with the right looks for the job and does a good portrayal of Lois’s story-crazy personality. 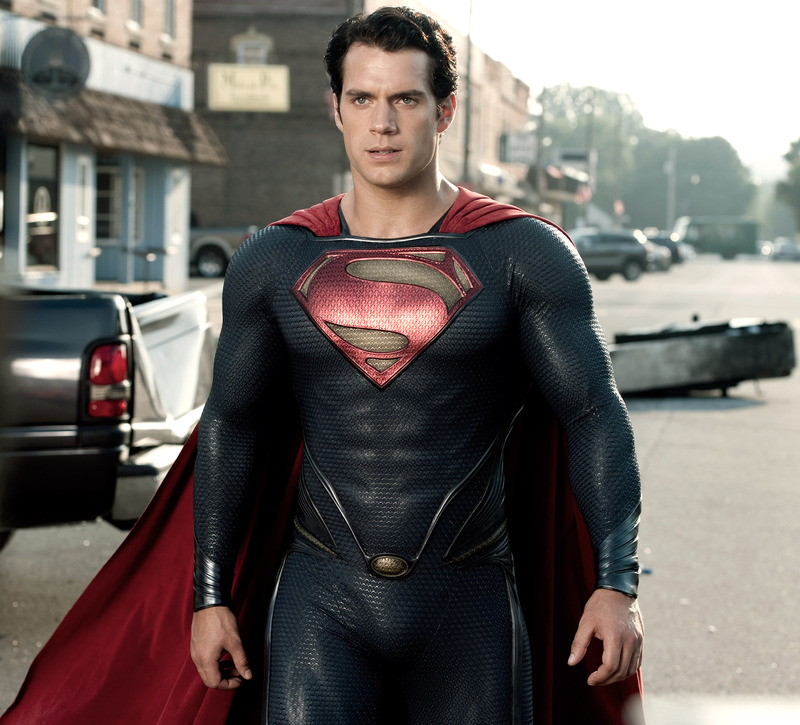 While some negatives can be found with the movie, none can be found with the cast for ‘Man of Steel’. Michael Shannon was the perfect General Zod. He was intelligent, every bit menacing, and portrayed Zod perfectly as his twisted, evil self. Shannon was also perfect for the role as far as appearance goes but how his character feel menacing just like in the comics helped him to really bring the character to life. His devoted second-in-command, Faora, was also a very good villain. Sure, she was incredibly annoying, and right down nasty, but she portrayed well by Antje Traue and certainly a good henchman style villain. General Zod and Faora no doubt served as good villains and were definitely portrayed better than in Superman II. Clearly the best and most exciting scene of the movie was the one that took place on krypton, the opening scene. 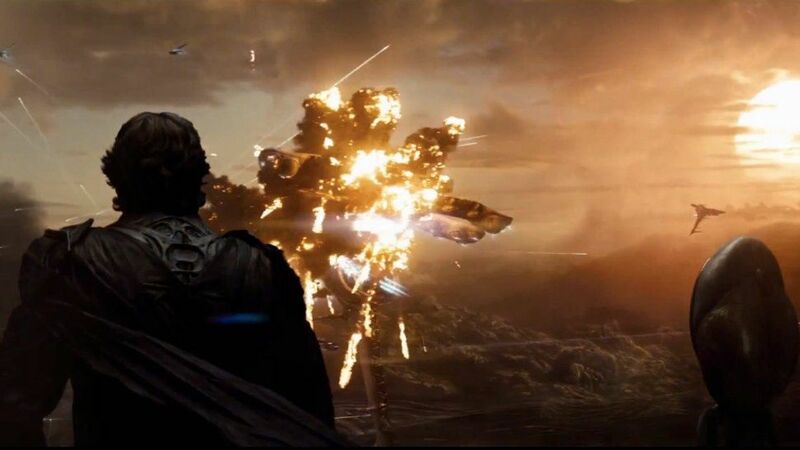 This scene showed Russell Crowe as Jor-El, Superman’s father, fighting Zod who is trying to take over the dying planet, and trying to save Kal-El, and thereby keeping the Kyrptonian race alive. This scene was a jazzed-up, flashy and explosive re-telling of Superman’s origin and actually how it really happened in most tellings. The scene was really enjoyable, getting to see Superman’s parents, and Krypton and even a fight scene on that planet. In addition the special effects in this scene were mind-blowing. While as a whole the beginning of ‘Man of Steel’ was boring and slow, the opening scene certainly does not fit into that category. The last thing I liked about this movie is the fight scenes and special effects, as I have mentioned throughout this post. The action scenes were very cool since you had three scenes with Superman fighting either Zod or Faora, and when you have an extremely powerful super villain and even more powerful superhero duking it out, the supped up fight that usually ensues is pretty cool to watch, especially since such usually result in lots if destruction and explosions which movie-goers love to see. The special effects though were the icing on the cake. I’ve never seen such incredible special effects or a movie that seemed so real from a CGI standpoint. All the characters were truly brought to life and superman in flight never seemed so amazing. Casually looking at ‘Man of Steel’, it is a good movie. There were several well-known and talented actors and all were excellent in their roles. The fight scenes, special effects and plot were all really cool. But looking at it critically or as a comic fan or even noting the fact that it is a franchise starter, you have to say it was good at best. From a slow start and a painstakingly boring and long backstory for the titular character, to a complete abandonment of Superman’s persona, personality and story, ‘Man of Steel’ will remain a controversial movie among fans, but is clear as day a poor franchise starter. You did an excellent write up on this film. I would think they could have done a quick preview of superman and then gone on. I wonder if they just didn’t have enough material and wanted to make the film longer.Great!